We provide standard lathe, milling machine, drilling machine and grinding machine guards. 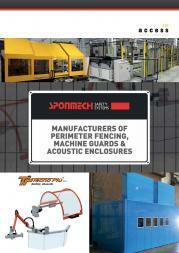 We supply Webster and Bennett guards from stock designs. We supply Horizontal boring machine guards from stock designs. Our top selling perimeter fencing systems are of a high quality and we can offer a extremely quick lead time from order. We CAD design and build CNC sheet steel punched and folded acoustic enclosures to your specification including powder coating if required. Replacement clear machine tool guard windows are available.